A longtime favorite of U.S. Special Forces groups, the ESS Profile TurboFan is better and tougher than ever. Following a series of vast improvements,the Profile TurboFan represents one of the most effective night-vision-compatible weapon against lens fogging. Powered by a single AA battery, the TurboFan system draws fresh airflow in through the lower edge of the goggle frame and forces humid air out the top at around 13,000 rpm. Even when perspiration or temperatures are extreme, this two-speed system will exhaust humidity and dramatically reduce lens fogging for over 150 hours of continuous operation (low speed). The improved fog-elimination system features the robust PowerPod battery pack, now with a push-button switch and repositioned near the back of the head for snag-free operation. New technology provides constant fan speeds as battery power diminishes, and an "Auto-off" timer shuts down the fan system to preserve battery life if accidentally left on. Water-resistant casing facilitates all-weather operation. The extra-thick, 2.8mm polycarbonate lenses offer maximum impact protection and 100% UVA/UVB filtration. 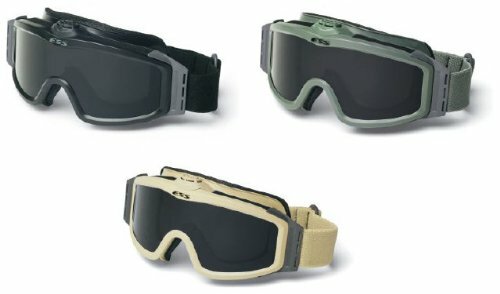 ESS' advanced ClearZone FlowCoat lens treatments provide the optimal combination of anti-scratch coatings on the outside of the lenses and anti-fog coatings on the inside. The Profile TurboFan is U.S. Federal OSHA compliant, and meets and exceeds ANSI Z87.1-2010, the U.S. Military .22 caliber ballistic impact test MIL-DTL-43511D (Clause 3.5.10), and CE EN 166. All Profile Series lenses provide 100% UVA/UVB protection and distortion-free optical clarity. Included with this kit is 1 Black Profile TurboFan Goggle, 1 Clear Profile Series Lens, 1 Smoke Gray Profile Series Lens, the Black SpeedSleeve, Soft Goggle Storage Case, Flannel Lens Sleeve, 1 AA Battery, User's Guide and ESS Sticker. If you have any questions about this product by ESS Eyewear, contact us by completing and submitting the form below. If you are looking for a specif part number, please include it with your message.